Tech Topics: 40-100G Ethernet. New "Installation" Tech Bulletin. See Tech Topics Below. Q&A: Interesting questions asked of the FOA this month. 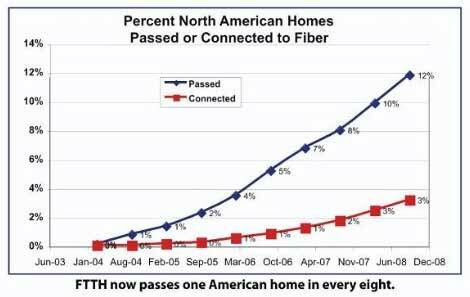 FTTH: 1/8 of all US homes now passed by FTTH, take rates at >30%. You can now renew your FOA certification online - and get a free extra month. Details here. We told you about the new FOA Online Fiber Optic Reference Last Month, but this month, we'd like to give you more information on how to use it. The FOA has created a online reference site for fiber optics that will be the most up-to-date comprehensive collection of information on fiber optics available anywhere. 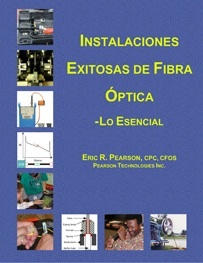 This unique reference site was created as a complement to traditional textbooks like our Fiber Optic Technicians Manual since it can be kept up to date more easily, can be accessed anywhere and is much less expensive than printed books. 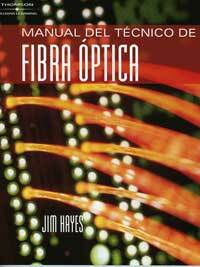 The Fiber Optic Technicians Manual, of course, remains available for those who prefer or need printed textbooks. The new FOA site was created with the goal of educating students, network users, designers, installers, etc. on the proper usage of fiber optic communications systems. In creating the materials, we considered the needs of many users and attempted to provide for their special needs. Everyone, of course, needs knowledge of the basics of fiber optics and skills in the processes used in designing and installing systems. 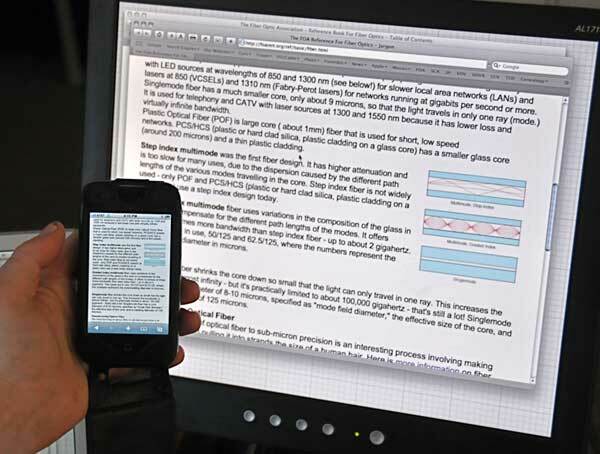 Schools need a reference for teaching fiber optics on many levels and a definitive reference for the certification exams. Network owners/users will be better able to understand their networks and work with contractors and installers to optimize their networks and maintain, restore and upgrade them properly. Contractors/designers will better understand how fiber is used properly, how to design efficient systems and how to communicate with their customers. Installers will find the basic information on fiber optic components, how fiber optic cable plants are installed, including tutorials of hands-on installation practices and how different types of installations require special skills and procedures. Special types of users, e.g. MIL/govt, utility, industrial, FTTx, will find soon sections covering the particulars of those applications and how that affects design, installation, etc. The material is also aimed to be a reference for our certifications so it will be annotated to assist instructors and students to prepare for them. One of the advantages of the web is the ability to include self-testing quizzes at the end of sections to allow the reader to test their comprehension. Try the ones now available in the sections of Understanding Fiber Optics for CFOT prep to see how they work. 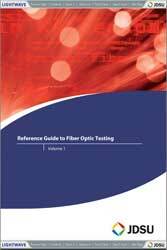 The FOA Online Fiber Optic Reference Guide is now available for use. It's not complete - we expect it to never be "complete" but always expanding! However, we do have a complete basic guide to fiber optics with a CFOT study guide and instructor's guide plus dozens more pages already available. We want you to start using it now and give us feedback on how we can make it better! 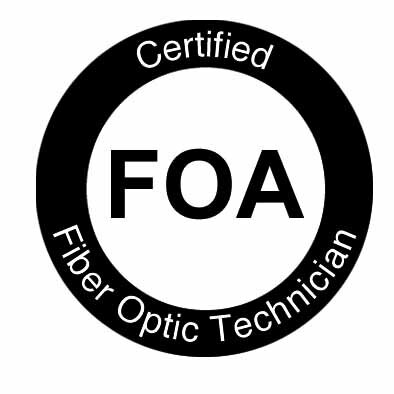 FOA Online Fiber Optic Reference Guide "Tour"
Each month, we'll do a quick tour of part of the FOA Online Fiber Optic Reference to show you what's there and how to use it effectively. This month we'll talk about the "basics" section, "Understanding Fiber Optics, The Basics." This section is just what is says - where you go to get a basic understanding of fiber optics and where you can prepare for the FOA CFOT exam. It's divided into 10 sections plus a glossary with lots of information, well illustrated. Each section has a quiz called "Test Your Comprehension" that is an online, automatically graded quiz on the material that will test you and give you the right answers and the reason for the answer. Obviously, this is the place to study for the CFOT exam, but it's also a great review section for CFOTs who might have been certified several years ago and want a refresher on new technology. 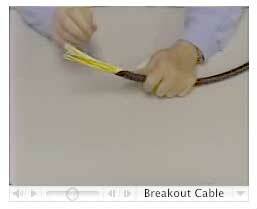 minimum bend radius and cable pull tension." What number(s) should be there? Is there an average cable pull tension for all optical fiber? A: Cable pulling specs are based on cable design and diameter. Pulling tension is rated for the cable type, typically 100-200# for indoor cable, 600#+ for outside plant. Bend radius is generally specified at 20X cable diameter under pulling tension, 10X relaxed after pulling. Under any circumstances, check with the cable manufacturer for specs on the particular cable you are using. Q: When we do the Link - Loss - Budget calculation, do we need to consider the any loss for cable bending. For our project, the Single Mode FO cable is run in cable tray, which has at least 4 to 6 bends (90 deg turning). If bending loss to be considered for each Bend, then what are the typical values for Single Mode Fibre. A: You should not include bending losses in link loss calculations since there should be no bends tight enough to cause loss. If the measured loss is higher than calculated loss, you should then look for bending loss with an OTDR. 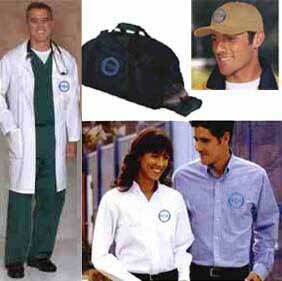 protection unless a metallic or armoured jacket is used. The FOA has added a new certification for our schools and current CFOTs, CPCT for "Certified Premises Cablilng Technician." Unlike some training in premises or structured cabling, the FOA CPCT specialist will focus on understanding the technology and processes involved in fiber, copper and wireless, rather than focusing on the rote memorization of the industry standards. These standards, developed by the TIA in the US and ISO internationally, are primarily written for manufacturers, not installers or contractors, and it becomes the duty of those manufacturers to develop products and inform their customers about their proper usage. Contractors and installers need to focus on the components and how they are used to build premises network cabling systems properly. FOA CPCT Certification is available through FOA-Approved Schools and soon directly for CFOTs. If you have a CFOT and wish to add a CPCT to your certifications, contact the FOA for information on how to study for and take the CPCT exam. Soon we'll also have a study guide for the CPCT on the FOA Online Reference Site. Design certification training is also starting at FOA-approved schools. Cabling Installation and Maintenance has an article in their November, 2008 issue "Super speeds on the horizon" about 40 and 100 gigabit/sec Ethernet by Tony Irujo and Dava Mazzarese of OFS. The title doesn't do the article justice - it's really a good overview of the current status of 40 and 100 gigabit/sec Ethernet and the cabling needs. Worth reading if just to note copper is only expected to go 10m! Municipal networks for CCTV surviellance, data and phones among municipal offices and intelligent traffic monitoring and control have become one of the more active areas of fiber installation. According to this Lightwave article, AT&T is building such a network for the town of Evansville, IN and its county, Vanderburgn. The work involves replacing an obsolete copper network with fiber. Read Lightwave. Lennie On OTDRs: For a dozen years now, Lennie Lightwave's Guide To Fiber Optics has been the most popular website for those getting started in fiber optics or wanting to look up some basic information. Now Lennie has added a new "virtual hands-on" tutorial on using OTDRs, based on the VDV Works OTDR simulator. Not only will it help you understand how to use an OTDR properly (not just turn it on and hit autotest, which may be your downfall!) but you can download a demo of the OTDR Simulator to try it yourself. FOLS latest newsletter. The latest news from FOLS including a standards update and access to their premises cabling cost model. What's the biggest security problem most organizations face? The answer might surprise some of you - it's disgruntled employees. Read "San Francisco Case Shows Vulnerability Of Data Networks" to see what we mean. Choosing, installing and using fiber optic products for network users. We continue expanding the Tech Topics section and have added some videos. These videos, in a format familiar to the "You Tube" users among you, cover cable prep, termination with epoxy/polish connectors, mechanical splicing and insertion loss testing. You need Quicktime to view these videos which you can download free here from the Apple website. Installation of aerial fiber optic cable is often done by lashing the fiber to a cable already installed or a messenger. Spiral HangerTM by Hein Electric Industries is radically new aerial wire hangers that radically changes conventional cable installation processes. According to the manufacturer, Spiral HangerTM has already enabled remarkable advances in safety and speed of communication cable installation work throughout Japan, and is highly rated by customers. On their website, you can watch video of an installation. Remove The Copper and Replace With It Fiber? About 13 million homes are passed by fiber optics now - about 1 in 6. In spite of the economy, FTTx is carrying on and costs are decreasing. About 1/3 of all subscribers offered FTTH are not taking it according to RVA quoted in Telephony Online. In underserved areas, it's over 50%. Partly it's because FTTH is developing the reputation as the best service but partly the take rate is up because the companies are able to hook up subscribers faster. Qwest roughly doubled its quarterly residential subscriber additions in the third quarter, adding nearly 40,000 new fiber-to-the-node (FTTN) subscribers and giving an early indication of the effectiveness of a primary strategic focus for the company. "We're moving the high-speed Internet product to be the anchor of what we're trying to do here," said Ed Mueller, Qwest's chief executive officer. The $300-million FTTN network Qwest began building a year ago now passes 1.5 million homes and is scheduled to pass 1.8 million by year's end. By the end of next year, that number could rise to 5 million, Mueller said today, or about 38% of Qwest's total footprint. The company could shift spending efforts to help feed its FTTN growth, Mueller said, but added that he wouldn't raise the company's overall capex budget to do so. Before they rolled out FTTN, Qwest's managers chose not to market higher speeds to customers who could get them by virtue of their proximity to a central office. But now the company is basing some of its marketing efforts on the higher speeds available to closer customers. "Before we did FTTN, you could have higher speeds if you're closer to the CO, but unfortunately, that's hard to market to and not really productive," Mueller said. "As marketing and advertising rolls out now, we get a pop from people who may be closer, and we're having programs against that. So we get the benefit of a prior capex spend." Verizon connects their 2 millionth FiOS home. Despite the sluggish economy, Verizon isn‚t backing off of the gas pedal when it comes to building out its fiber optic FiOS network. Verizon plans on having FiOS in more than its previously stated goal of 18 million homes by the end of 2010, according to Reuters. Verizon President and COO Denny Strigl said that the company would continue to expand its FiOS network to the tune of more than $20 billion, while doing so at a faster rate than the original plan called for. Verizon‚s FiOS rollout was initially slower than expected due to a lack of equipment, such as set-top boxes, as well as the regulatory approval process in the states where the telco wanted to rollout the triple-play service. The $86-million investment will extend Verizon's FiOS TV service to an additional 10 communities and expand its Providence-based Fiber Solutions Center, where at least 50 more union-represented technicians and customer service representatives will be hired, say Verizon representatives. From the Philly.com web journal. Verizon is now deploying GPON in its network in new developments in California, Maryland, Massachusetts, New Jersey, New York, Rhode Island, Pennsylvania, Virginia, and Texas. GPON offers more bandwidth than the BPON currently used, allowing more features for FiOS TV for example. See this Lightwave article for more info. Where is Verizon offfering FiOS service? See this map. Under general supervision the Fibre Optic Splicer provides moderately complex work in fiber optics installation and maintenance, including performance and fusion splicing and testing. Ensuring the quality of buried and aerial optic facilities by overseeing the end result of contractor and/or in-house work and performing activation related duties. FieldSolutions is the leading provider of quality field souring. We have an immediate need for a field technician experience in TELECOM and CABLING to become a preferred technician. This preferred technician will operate within a specific geography, there are openings for technicians nationwide. The duration is ongoing- the requests last from 1-4 hours. The calls are paid hourly or at a flat rate depending on the nature of the call/ client. PROJECT DESCRIPTION: Need a strong and flexible field tech to be a Preferred Tech for client to perform TELECOM/CABLING break fix work on a weekly basis. This assignment is best suited for an easy going technician capable of taking on field related assignments with little supervision and off the cuff. TOOLS: Skills/Tools assessment checklist to be provided to potential candidates once established. Must have reliable vehicle capable of carry multiple parts. Must have unlimited cell phone plan as being contacted in the field for potential new calls is a must. TECH REQUIREMENTS: Strong background in cabling and telecom type calls. Skills/Tools assessment checklist to be provided to potential candidates once established. Volt Telecom Canada is looking for some qualified Fiber Optic splicers to perform work in Alberta. Our first priority is in the Calgary, but there may be other locations throughout the province as well. Successful candidates would require good experience in spicing underground and aerial fiber optic ribbon cables. Copper cable splicing skills would also be an asset. We are currently looking for individuals who have their own truck and tools and would be interested in becoming a independent contract to Volt Telecom. Volt telecom will provide the fiber optic ribbon fiber splicing equipment. If you know of any of your association members who would be interested in leaning more about these opportunities please have them contact myself. hire and comes with excellent benefits. Verrillon is looking for an Outside Sales Representative to sell specialty optical fiber and cable products and development services within an assigned territory. The territory is anticipated to be all accounts in the United States and Canada except for the Oil & Gas market vertical and any house accounts. Objectives will include prospecting on behalf of the assigned territory/region, customer/prospect meetings, product proposals, closing sales, and appropriate follow-up activities via visits, phone, email, etc. This position requires previous specialty optical fiber sales experience along with a strong understanding of the specialty optical fiber market and competitors. The position is based in North Grafton, MA for local hires. Candidates residing elsewhere in the United States with a home office are also encouraged to apply. Interested candidates should contact Ed Connor at <mailto:connor@verrillon.com>connor@verrillon.com or 508-890-7141. Linden Photonics is a small company that develops packaging and cable technology. Specializing in fiber optics and using novel extrusion/molding techniques for thermoplastics, Linden focuses on military and other harsh environment markets. We are looking for a part time manufacturing engineer to help set up our in-house manufacturing and quality procedures as well as assist in the design/set-up/and usage of specialized in-house equipment related to optical technology and cable winding and spooling. The ideal candidate will have a mix of manufacturing and mechanical experience. Experience with ISO type record keeping is desired and fiber optics experience is a plus. 5 to 10 years experience in manufacturing and a BS in an engineering or equivalent technical degree is desired. Can You Teach? Would you like to? Go to the "Teaching Opportunity " on the BDI DataLynk,LLC Web Site or call: 512-785-9024 for more information. Preference given to someone who has recently worked in product marketing for a company making fiber optic cable, connectors or patchcords. Position open for a Product Marketing Manger for our Fiber Optic product line. Reporting to the VP/General Manager, the Product Marketing Manager is responsible for managing the P&L for the Fiber business. This manager is responsible for the product portfolio, new product development, pricing, go-to-market strategies, and marketing communications. - Lead the development and implementation of a 3-year strategic product-marketing plan for the Fiber Optic product line. Effectively communicate and lead the implementation of this strategy throughout the organization. - Lead development of a 3 year product roadmap that optimizes Quality, Delivery, Cost and Innovation while addressing key solution gaps outlined in the Market plans through internal product development, partnering and/or acquisitions. - Coordinate development of future innovative products and technologies in line with strategic goals. Marketing Communication – Increase sales and the product line through innovative integrated Marketing, PR and advertising plans. - Work with sales team to develop integrated business plans and sales strategies that are aligned with the annual and 3 year plans. - Lead the development of price targets and product positioning. � Senior level product marketing fiber optic experience. recommending and taking actions as needed to maximize margins and revenue. products and recommendations for product lifecycle. Follow up on new leads and referrals resulting from field activity, trade shows, advertisements, etc. ADC provides the network infrastructure equipment and professional services needed to deliver voice, video, Internet and data communications around the world. Wireline, wireless, cable, enterprise and broadcast network operators rely on ADC‚ADC's offerings to deliver bandwidth intensive, high-speed services to residential, business and mobile subscribers. ADC (NASDAQ: ADCT) has sales into more than 140 countries. Provide technical support to the manufacturing operation that enhances quality, improves delivery, and reduces costs through product/process improvement, operator training, equipment selection/installation, and product development. Ensure existing and new products can be manufactured on robust and cost-effective processes by optimizing process settings, tooling, and procedures. Monitor equipment, and work with vendors to reduce costs. Troubleshoot and resolve short term and long term manufacturing problems that impede quality or cost effectiveness. Develop and administer training on new and existing equipment and products for manufacturing personnel to ensure product/ process consistency. Identify, document, and effectively communicate all critical process parameters, tooling, and materials. Development and maintain documentation. Manage capital projects and provide technical support for the specification, design, purchase, installation, and commissioning of new equipment, retrofits, and tooling. Manage Product Development projects as assigned to ensure successful release of commercial products in terms of reliability, cost, and manufacturing. Work with vendors, Marketing, and Operating personnel, Product Management, Sales and/or Customers to meet product requirements. Develop, improve and implement production/processing methods and business processes that positively impact cost, quality and safety objectives. Initiate and develop Lean process improvements. Lead and participate in constructive discussions with management and operating personnel regarding quality/ process problems, cost reduction projects, and training issues. Provide reports as needed. Ability to read, analyze, and interpret general business periodicals, professional journals, technical procedures, or governmental regulations- respond to questions. Ability to utilize logical and scientific thinking in a variety of circumstances. Focus on continuous quality improvement. Ability to understand and follow all safety guidelines. Flexibility to changing priorities, sensitivity to others feelings, viewpoints. Ability to take calculated risks. Travel up to 5% possible. I am in need of at the present time is an individual that can assist my clients as needed. He or she could be called at any time, and there is a 4 hr response time. We’ll pay a decent rate along with a Truck Roll Allowance for the drive. Some of these locations could be up to 200 miles away, but we try to find technicians as close to the location as possible. Way paid out to the job. Looking for two individuals or two staff from a private firm for inside premise (ISP) install of CAT6 and Fiber Optic cables. The primary site is a large data center with adjacent offices, all currently under construction. Desire individuals with BICSI or FOA certifications, industry certifications or equivalent experience. Experience with testing CAT5/6 and Fiber desired. This will be a six-month assignment in a safe and friendly foreign country with living conditions equal to the US. All travel and relocation expenses paid. Housing in two-bedroom furnished townhouse close to work site. Cell phone, Internet, cable TV, utilities, medical insurance and vehicle provided. Salary in US dollars with a bonus at completion of project. Employer is a large multinational design and build firm. Desire US installation and NEC code experience. What's this and why is it used?, see below. 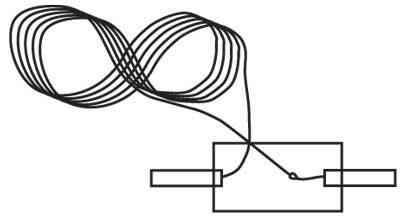 It's a "figure 8" - a technique used for intermediate fiber pulls to prevent putting a twist in the cable. See here for more information.